Blurtsyan D.R., Blurtsyan R.S., Blurtsyan I.R. The paper presents the research results of shape error formation regularity in the plunge centerless grinding of driveshaft cross-piece journals according to the thermal state of the machine and its temporary stops. The results provide decrease in the shape error of driveshaft cross-piece journal surfaces. The paper presents the dependences of shape error change (ellipticity, faceting) on the machine thermal state and its temporary stops. Various conditions of the machine thermal state (the state of long-term heating, the state of long-term cooling, the state of overnight stops) have been studied. The measurement of shape error parameters have been performed by means of the circularity meter. A number of circulargramms have been recorded under certain recording increase and their further processing. The results of the research are presented as guidelines for the use of technology in driveshaft cross-pieces production. It has been experimentally proved that the machine thermal state effects the shape error formation in driveshaft cross-pieces grinding. Being in the state of thermal balance, the machine provides greater shape precision in driveshaft cross-pieces centerless grinding. Keywords: shape errors, centerless grinding, cross-pieces, the machine thermal state, stops in the machine operation. Blurtsyan R.S., Blurtsyan D.R., Blurtsyan I.R. The study of regularities of formation form errors, surface roughness and waviness in the mortise centerless grinding pins frogs drive shafts, depending on the speed of the leading circles // Engineering industry and life safety, 2012, № 1 (11). – P. 47-50. Blurtsyan R.S., Blurtsyan D.R., Blurtsyan I.R. The study of regularities of formation form errors, surface roughness and waviness in the mortise centerless grinding pins frogs drive shafts, depending on the momentary cross feed // Engineering industry and life safety, 2012, № 1 (11). – P. 51-54. Blurtsyan R.S., Blurtsyan D.R., Zalazinskiy M.N., Selihov G.F., Blurtsyan I.R. Study fatigue torsion shafts treated without grinding operations // Engineering industry and life safety, 2008, № 5. – P. 128-130. Blurtsyan D.R., Blurtsyan R.S., Blurtsyan I.R. Possibility of increasing the service life of the torsion shaft engineering methods // Engineering industry and life safety, 2009, № 6. – P. 85-90. Blurtsyan D.R., Blurtsyan R.S., Blurtsyan I.R. 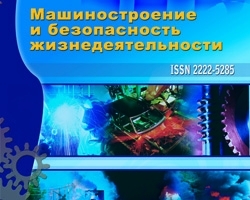 Investigation of the effect on the quality of the cutting surfaces with mortise centerless grinding // Engineering industry and life safety, 2010, № 7. – P. 89-94. Blurtsyan D.R., Blurtsyan R.S., Blurtsyan I.R. Technological features of the formation of residual stresses in the surface layers of the torsion shafts running // Engineering industry and life safety, 2011, № 1. – P. 17-20.